This is an EXCLUSIVE Preview from my "Slimming in Seconds Program!" I'm a BIG fan of foam rolling - if you're unfamiliar with rolling....it's an increasingly popular method of Self-Myofascial Release, or SMR. It's like giving yourself a deep tissue sports massage whenever you need one! No expensive clinic appointments or hassle scheduling therapy! This is a KEY skill I teach patients in my clinic because it makes my job and my life SOOOO much easier. A few minutes foam rolling can lead to a LIFETIME of being injury free, which means I have to spend less time in the clinic putting people back together. Corrects muscular imbalances (proper rolling returns shortened muscles to their normal length). 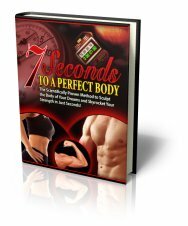 If you need a detailed training guide (and believe me when you see the results of your Isometric Workout you'll want one) I've written a comprehensive guide to Isometrics called 7 Seconds to A Perfect Body. It's over 250 pages long, with hundred of step by step images to help you get your angles correct and even step by step work along video guides. You can check it out here. Your skeletal muscle tissue contains 2 types of receptors. The first is the actual muscle spindles, studied and explained in detail in my Perfect Body course. These spindles are extremely sensitive to change and the adjust the rate of change of your muscle length (try to do a side splits - see they way your inner thigh tenses really tight and won't let you move, it is due to those receptors). If you have very tight muscles this can cause you a LOT pain and great discomfort. The second type are called the GTO's for short. Long hand it stands for the Golgi Tendon Organs . These tiny little regulators are found in the insertion point between muscle and tendon. These are sensitive to the rate of change of tension in muscles. In Isometric Stretching, which I discuss on Isometric Training.com - here - we are manipulating the tension of the muscles through voluntary isometrics contract - but that can be VERY hard for some people to master. The easier way is with foam rolling. By applying pressure on to the GTO's this creates tension. The GTO's recognize this and in turn become overloaded. As such the over ride the muscles spindles attempt to shorten the muscle (if you shorten a tensed and contracted muscle there is a risk you'll rip it off the bone, so guess what the body does...the GTO's switch off the muscle spindles, and hey presto - the muscle relaxes and loosens. It's a magic switch and the same principle a massage therapist works on when digging into your muscle tissue.